Hull-O Family Farms is a farm stay located in Durham, New York, in the state's Catskills region about 2.5 hours north of New York City and one hour south of Albany. The farm has been in the Hull family for seven generations, and in continual operation since 1779. Staying on a working farm can offer an intimate glimpse of what farm life is truly like. 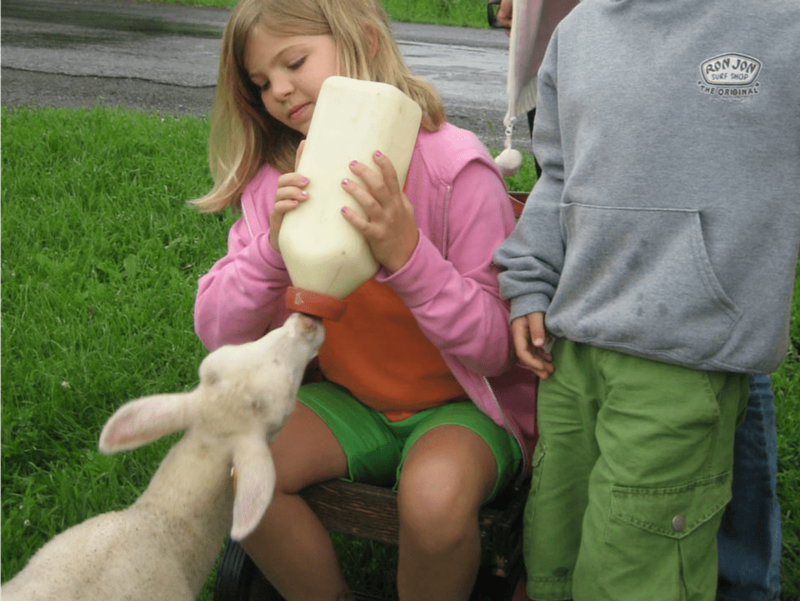 Kids can get a learning experience here, including a firsthand look at where food comes from. The farmer will teach you the best way to get eggs from the chickens, how to hold the bottle for baby goats and lambs, and the best technique for milking a cow. The farmer will share some old farming tricks, such as what signs to look for when predicting rain and other weather. Families stay in one of three private guesthouses. One has four bedrooms. Prices include home-cooked breakfast and dinner, served family-style in the farmhouse dining room. The house features a wrap-around porch where guests can relax. A children’s menu is available upon request. Vegetarian options and allergy-free options are also available. Guests have the option of participating in the daily farm chores, such as milking cows, collecting eggs, feeding pigs, and so on. There are often kittens and other animals to pet. Most of the chores are done in three-hour periods in the morning and the afternoon. Evening fun might include bonfires with s’mores. The farm features a corn maze in the fall, between mid-September through October. Farm stays aren't right for every family. If you appreciate the anonymity of a hotel, you may not enjoy sharing so much time, including meals, with people you don't know well. Because of its easy access from New York City, the Catskills have long been a favorite vacation spot for New Yorkers. The mountains are also famous as the backdrop for the 19th-century Hudson River School paintings. The Catskills is home to many artists, musicians, and writers, especially in and around the towns of Woodstock and Phoenicia. The Tonight Show host Jimmy Fallon grew up in Saugerties. Nearby attractions in the Catskill Mountains include Zoom Flume WaterPark, Windham Mountain, and Hunter Mountain. River canoeing and kayaking are also popular. There are 42 kayak-able rapids ranging from class I to V+. Other family-friendly places to stay nearby include Mohonk Mountain House, Rocking Horse Ranch, and many more Catskills resorts.